Bridge cameras typically offer DSLR-like functionality and generously long zooms at an affordable price point. But the Nikon Coolpix P500 replacement is taking this to the next level. 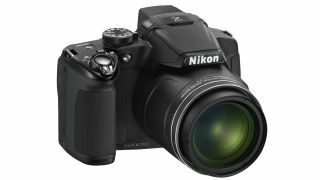 To combat the wobbles and help improve sharpness, the P510 features Nikon's second generation of lens-shift VR (Vibration Reduction), something the P500 lacked. That said, you'll still need a very steady hand – and plenty of light - to get sharp pictures from a 1000mm equivalent lens, as the maximum aperture at this setting is f/5.9. The 1/2.3in CMOS sensor offers a resolution of 16 megapixels and is back-illuminated, which helps the P510 achieve faster processing times and should ensure improved performance in low light. The normal sensitivity range runs from ISO 100-3200, and is expandable to an equivalent of ISO 6400. The high-res 912k-dot LCD monitor can be tilted for shooting in awkward positions. This is particularly useful for low-level close-up photography and it makes shooting video a breeze. The scene also has an anti-reflective covering to improve visibility when using it in bright light. Like any bridge camera worth its salt, the Coolpix P510 offers a direct movie recording button for quick recording of 1080p Full HD movies with stereo sound. You can use the optical zoom with autofocus while recording, though how much of the operational sound will be picked up by the on-board miss is unclear. The P510 can also shoot slow or fast motion at speeds of up to 120 fps (VGA) and in Apple-friendly iFrame format. A built-in Global Positioning System records the latitude and longitude of the location where a picture, saving it in the EXIF data. The P510 lets you shoot a burst of up to five full-resolution pictures at 7fps or up to 30 full-res shots at 1fps. The P510 offers a 42x zoom that gives the equivalent reach of a 24-1000mm lens – all for £399.99. The P500 replacement goes on sale from 22nd March.